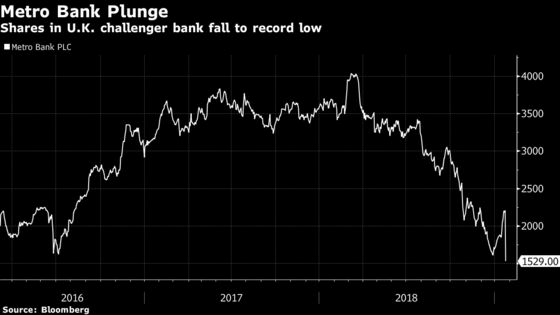 (Bloomberg) -- Metro Bank Plc fell the most since going public after applying an incorrectly low risk weighting to parts of its loan book, with the British lender’s chief saying he doesn’t know how long the mortgages in question had been wrongly classified. "It was a misinterpretation of the rules,” and the misclassification dates back through 2018 at least, Craig Donaldson, Metro Bank’s chief executive officer, said by phone. “We are putting it right,” he said, calling it an “isolated incident” that didn’t affect the bank’s earnings. He said the bank has been in communication with Britain’s Prudential Regulation Authority. A spokesperson for the regulator declined to comment. The bank previously put a 50 percent risk weighting on its commercial mortgages, but said it has now increased this to the correct level of 100 percent, a spokesperson for the lender said. For buy-to-let mortgages, the portfolio had been held at a risk weighting of 35 percent, but this has also been increased to 100 percent. Donaldson, who has been CEO since 2010, said Metro Bank hired a major accounting firm to examine the matter. “We need to get through the process of what we are doing now,” he said. “What will follow will follow." He said he has no plans to leave the lender. The bank said it discovered the misclassification as part of an internal review, but transcripts of past conference calls show some observers of the company were perplexed about how the company was categorizing its assets. “The risk weight on the commercial real estate portfolio, if my math is right, it is 60.4 percent, which just seems low, given where those standardized risk weights should be. Do you mind just helping me understand the disparity there?” Nishil Patel, a financials analyst at Basswood Partners, a New York-based hedge fund, asked in a November call with management, according to a transcript posted on Metro Bank’s website. David Arden, who became Metro Bank’s chief financial officer in March, responded that he didn’t have the details at hand, but “we continuously look at all the risk weightings we have, and we are constantly reviewing that.” Patel didn’t immediately respond to an email seeking further comment. Christopher Cant, an analyst at Autonomous, wrote a note in October that said his firm had noted a “strangely low risk density relative to peers” when it started coverage a year earlier. Metro Bank also said Wednesday that unaudited pretax profit for 2018 was 50 million pounds ($65 million), missing the 59 million-pound average estimate of nine analysts surveyed by Bloomberg. British lenders including another so-called challenger bank, CYBG Plc, have said uncertainty around Brexit pushed down confidence in the last quarter of 2018, though Metro made no mention of the political and economic environment in its statement. Its total capital ratio, a measure of financial strength, stood at 15.8 percent at the end of 2018, compared with 19.1 percent reported for the end of September. Donaldson said the bank will “no doubt” be holding more capital against the mortgage assets in question. "The pace of capital attrition and the risk-weighted asset intensity uplift brings the question of the timing of the next capital raise to the fore,” said Colin Jackson, an analyst at Goodbody in Dublin. The shares closed down 39 percent at a record low of 1,345 pence, and posted their biggest daily drop since Metro Bank’s initial public offering in 2016. That cut the company’s market value to less than 1.5 billion pounds. The lender’s 250 million pounds of junior bonds, which were issued in June to bolster its financial reserves, fell 5 pence on Wednesday to a record low of 82 pence on the pound, according to data compiled by Bloomberg. Donaldson was an early hire of Vernon Hill, who has said he wants Metro Bank to be bigger than Commerce Bancorp Inc., the New Jersey-based firm he started with one outlet in 1973 and sold 34 years later for $8.5 billion. 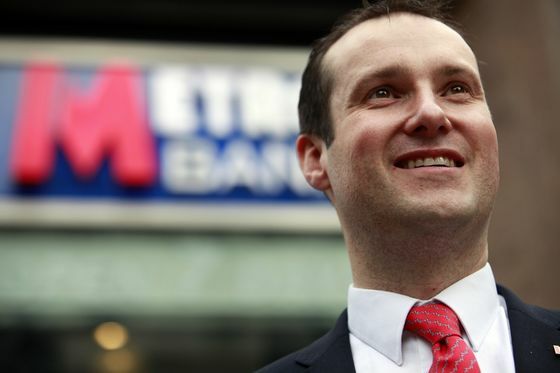 Metro was part of a generation of challenger banks that sprung up in Britain after the financial crisis, taking the nation’s four big established lenders. Its shares performed strongly after its IPO, doubling by March of last year, before tumbling as loan growth slowed. Willett Advisors LLC, the investment arm for the personal and philanthropic assets of Michael Bloomberg, held a 2.7 percent stake in Metro Bank as of July 2018, according to data compiled from regulatory filings. It was not clear whether New York-based Willett still holds these shares. A spokesman didn’t immediately return a call and email seeking comment. Bloomberg is the founder and majority owner of Bloomberg LP, the parent of Bloomberg News.